With the vast selection of products and services online, shopping has never been so easy and convenient. You can definitely find any products or get your needed services with just a simple online search. But is it really that simple? While this huge option seems to be a positive trait, online shoppers may find it hard to discover the perfect products when faced with too many items to choose from. This slows down their decision-making process, thus, hurting your conversion directly. There are 149,427 available shoes, excluding premium brands, to choose from. That’s just one online store. Now, imagine if you search it on Google. This can be particularly overwhelming for many online shoppers. This overwhelming feeling is called the psychology of overchoice. Today, you will learn more about how and why too many choices can affect the decision-making process of shoppers and some practical tips to simplify your shopping experience and avoid customer overchoice. The principle of overchoice, also known as choice overload, explains that having many available choices at once negatively affects the decision-making process. If shoppers have access to too many equally viable options, it becomes overwhelming for them to decide because of the variety of potential results and risks associated with picking the wrong choice. But, don’t get us wrong. Choices are actually very essential for customers. 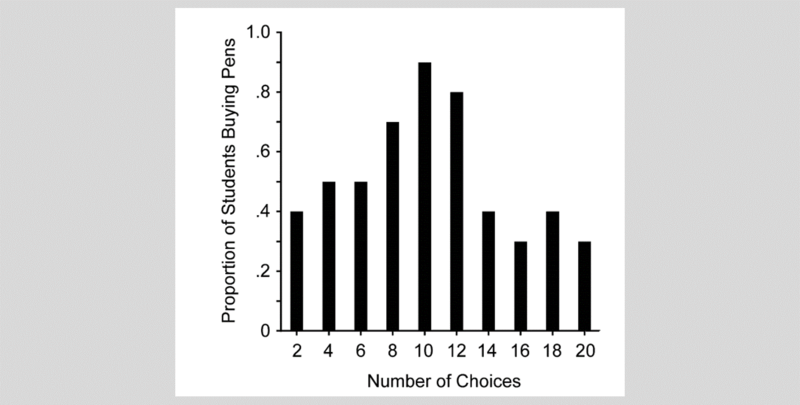 In a study about the number of choices and buying behavior, it was found out that having no other choice results in no purchase. At first, having more choices leads to more purchases. But as the number of choices goes up, people tend to get more confused, pressured, and ultimately ending up with dissatisfaction. The freedom to choose is vital, but too much of that can also lead to adverse effects. Presenting shoppers with many available options can result in decreased motivation to make a purchase and reduced satisfaction after a choice is made. Overchoice makes it difficult for people to decide and will eventually end up leaving your site without a purchase. Every additional choice demands more additional time and effort to evaluate a product. Thus, the key to providing options to customers is to find the perfect number of choices and provide other interventions to overcome irrational decision biases. The main idea of the above rules is to follow the “less is more” principle. You want to lessen all areas that complicate the shopping experience and reduce anything that provides too many alternatives. While there are individual biases to overchoice, there are different ways to minimize the overwhelming task of deciding what to purchase when your customers are faced with many choices. The call to action (CTA) is a very crucial element to any webpage. It prompts your website visitors to take a specified action. 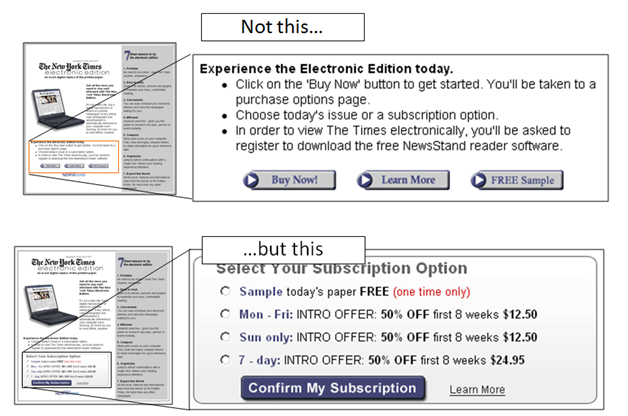 CTAs are usually displayed as buttons or hyperlinks, such as ‘Buy Now’ or ‘Subscribe Now’ to tell visitors what to do next. With the lack of a clear CTA, visitors won’t have a clue on what necessary steps to take which will most likely push them to leave your site without converting. On the other hand, having multiple CTAs one a single page may confuse your visitors, causing them to make no choice at all. Aside from making your CTA clear and eye-catching, it is important that you switch from multiple CTAs to just one per landing page. This will ensure that you are not overwhelming your customers with so many actions to take all at once. A study concurred this when 3 CTAs were reduced to just one, they saw a 64% increase in conversion. Traditionally, most eCommerce stores want to add or extend their product offerings because of the assumption that shoppers demand as many choices as possible and that people have varied preferences. But, interestingly, recent evidence shows that more and more customers are requesting fewer choices. For instance, a Forester Research survey revealed that customers are foregoing unlimited choices for more curated choice, where sellers handpick possible choices and suggest a limited option. A classic study echoed this when Sheena Iyengar and Mark Lepper performed their famous jam experiment. They wanted to find out if the number of product variations would affect conversion rates. The field experiment presented consumers with either a stall of limited (6 flavors) or an extensive (24 flavors) selection of different jam flavors. The stall with more jam flavors attracted more customers, 60% in contrast to 40%. But what’s interesting is how the two stalls performed in terms of sales conversion. The stall offering just 6 flavors of jam had a 30% conversion rate compared to the 3% of the stall with 24 jam flavors. What it means is that while you can attract a lot of traffic because of extensive product lines, a high conversion rate won’t be guaranteed. Offering fewer product lines means you have well-curated products. Thus, reducing the overwhelming cognitive decision and increasing your chances of conversion. For example, a food company wanted to reduce the complexity of its product portfolios by analyzing the complexity of its product offerings and determining what consumers did not consider to be valuable offerings. Over the next several years, the company anticipates lowering the cost of goods sold by up to 7% while increasing its sales by up to 2%. Product titles are essential conversion drivers because they help shoppers to decide what products to purchase. Writing complicated and lengthy product titles could jeopardize your sales. In fact, 20% of purchase failures are caused by unclear or complicated product titles. With this, you want to ensure that your products titles are named and formatted appropriately with the right length. This will increase the chances of getting discovered by potential shoppers which means a higher possibility of getting more people to convert. While there’s no right number of characters in a product title, we recommend being brief but concise. It means that you have to be as descriptive as possible without having to write a lengthy title. In fact, making sure that you optimize your product title with the perfect length will help you get 51% more clicks. As a rule of thumb, you can follow the policy requirements given by your listings. Amazon, for instance, has a clear policy of using 50 characters maximum for product titles as a general rule. You want to stay under those characters but we recommend you go just below 30% of the maximum. Sales promotions are particularly helpful if you want to drive immediate conversion. But, often we see too many eCommerce stores offering multiple discounted products. You’ve probably experienced this first hand. Have you checked your emails lately? If not, open your email and just see how many online sellers offering different products with the same little discounted price all at once. Offering shoppers with too many insignificant discounts don’t only make too much customer overchoice, it won’t provide much value for your customers. We’re not saying you avoid giving discounts at all. In fact, we encourage you to offer discounts but in moderation. It’s not about the quantity of offered discounts but the quality of the discounts, meaning bigger discounts are more significant and valuable than a thousand small price cuts. For example, Indochino ran a test on its email promotions by skipping their weekly email batch-and-blast and substitute a simple yet highly targeted email by just sending a recommended bundled promo of 3 products to previous customers based on their recent purchase. In a study investigating the effect of time pressure on consumer choice deferral, it was found out that in the absence of time pressure, customers are likely to make trade-off comparison, making the selection decision more difficult and resulting in choice deferral. However, if time pressure is added, the decision-making process becomes easier and faster. Thus, the choice of deferral has been decreased. For instance, online stores offering nominal discounts to provide customers with an incentive to purchase can add time pressure by setting an expiry to their discounts. The limited amount of time will encourage shoppers to make a choice faster. You can easily add time pressure and increase a sense of urgency by creating limited-time offers. Checkout Boost has a countdown offer feature which allows you to set a countdown timer to your discounts or sales promos. Drive your shoppers to make purchase decisions immediately when they are faced with choice overload by enabling a countdown offer which urges them to take advantage of a promo before the time runs out. While too many product choices can lead to overchoice, a research found out an exception — if shoppers know exactly what they want, they actually want to have a greater number of available products to choose from. Although you wouldn’t exactly know if the customers have the idea of what they are looking for, you can still be offering a large assortment of choices without resulting to choice overload. What you can do is to provide your visitors with clear navigation and categorization of your products. This will enable them to discover the right products based on their preferences while reducing the likelihood of overchoice. Review your current product categorization scheme and make sure that the right products are categorized the right way. You can create a new product category for products that are better grouped together like peanut butter and jelly. Be complementary: Like the soda and chips scenario above, think of product categories that are better when they are grouped together, like fruits and vegetables or shoes and bags. 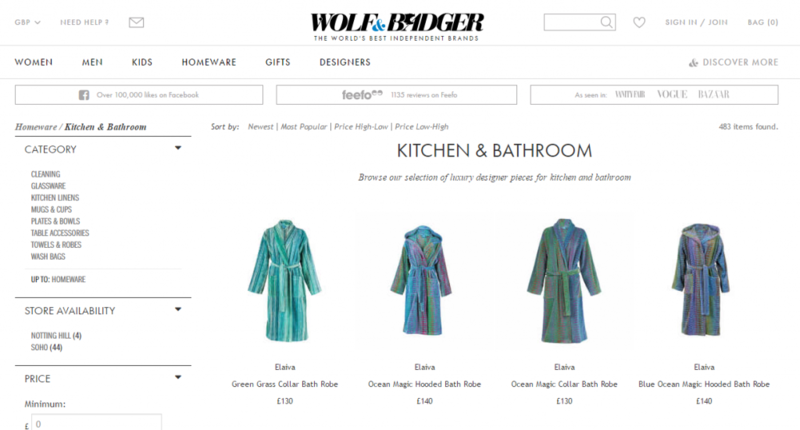 For example, Wolf & Badger has a single category page for kitchen and bathroom products. Customer choice overload is a common challenge shared by a lot of eCommerce stores that could potentially affect conversion rates. When customers are presented with too many options at once, they become overwhelmed and undecided, pushing them further away without converting. Unfortunately, there is no exact science as to the number of offerings that can be presented to a customer as individual preferences vary. The good news is: there are simple tweaks that you can immediately implement on your site to reduce overchoice, such as limiting the choice alternatives and simplifying your website. Bear in mind that conducting split testing and making continuous improvements are key ingredients to help battle customer choice overload and push them to conversion as soon as possible.